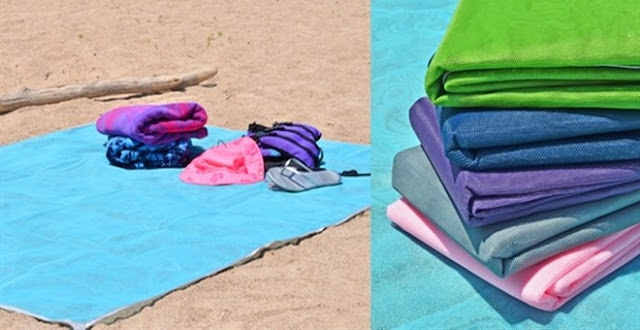 Head over to get this Sandless Beach Blanket for ONLY $19.99 (Retail $39.99)! This is available in six different colors! Developed for military use, this is the beach mat that is impossible to cover with sand. Used in military applications to contain sand and dust when helicopters land and take off, the mat is made from two layers of patented woven polyurethane that instantly filter sand to the beach as soon as it falls on its surface. The specially woven polyurethane acts as a one-way filter to prevent sand from reemerging through the bottom of the mat. The 36' sq. mat also eliminates dirt, dust, and water from its surface, ensuring a perpetually clean outdoor expanse for camping or watching a concert. The rip-stop polyurethane construction resists abrasions from outdoor furniture or pets, the bound edges remain flat, and the mat won't absorb moisture, preventing mold and mildew. Metal D-rings on each corner accommodate ground stakes (not included).